The Navman iCN 330 satellite navigation device is simple to use and there are lots of ways to plan your route, so you can be on the move quickly and easily. 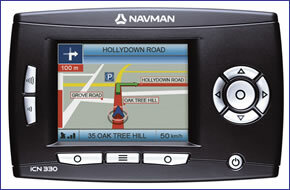 The Navman iCN 330 GPS comes complete with detailed maps of the United Kingdom. Navman iCN 330 has been discontinued. Accessories, spares and parts are still available for your iCN 330, as are a limited number of road maps. The Navman iCN 330 GPS includes an integral antenna with excellent GPS reception providing door-to-door navigation. The Navman iCN 330 satellite navigation system provides voice guidance and displays your route on an anti-glare high resolution colour 3D moving map, in 2D or instruction-by-instruction. The Navman iCN 330 GPS satellite navigation includes detailed maps of the United Kingdom. Whenever a manoeuvre is coming up, the Navman iCN 330 progress bar turns red. And if you do miss a turn, the Navman iCN 330 automatically recalculates a new route with its Back-on-Track function. In addition there is are multiple routing options, eg, shortest/fastest, nearest POI. Designed with simplicity in mind, the Navman iCN 330 has a user-friendly interface, is easy to install and ready to drive away straight out of the box. The Navman iCN 330 provides detailed maps of the UK and Ireland via TeleAtlas Maps. Which in addition to street information include features such as route calculation, Points of Interest, Estimated Time of Arrival, and more. Further Navman iCN 330 maps are available SD card which insert directly into the Navman iCN 330. Available maps include, France, Germany, Spain and Australia. View the complete range of maps available for the Navman iCN 330. Although the Navman iCN 330 has been discontinued, a number of accessories are still available to buy from ActiveGPS. These accessories and spares include: vehicle power cable, windscreen suction mount , mains power charger and external GPS antenna. The ONLY Navman Maps now available to purchase for your Navman iCN 330 are The Nordics (which include Denmark, Sweden, Norway, Finland) and Canada. On SD card.